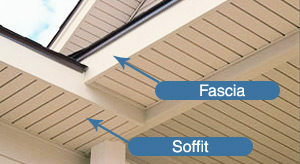 Soffits and fascia play an important role in protecting your home and reducing the impact of sun, wind and rain. With a variety of colours available, they can also provide a personal touch to accent and beautify your investment. Soffits are located under the overhang of the roof deck and act as an air intake for the attic space. A vented soffit plays a major role in your roofing system and in the overall comfort of your home or commercial building, yet it is often overlooked. Many older homes do not have an adequately vented soffit area, which leads to a poorly ventilated attic. This can cause ice damming and condensation in the winter, an overheated living space in the summer and can shorten the overall life of all your roofing materials. Great Canadian can inspect your home or building to help you find the right solution. Soffit and FaciaFascia covers the truss tail ends where the eavestroughs are attached, and along the gables. Not only does fascia add a personal touch to your home, it protects the wood beneath from moisture and the sun’s UV rays. There are many styles of fascia in Calgary, and Great Canadian can help you choose the right fit for your home.